Installed this piece in the foyer of a client’s home last week. Had to use scaffolding and all that bit, with me sitting reading a book while providing the installers with moral support. Damn I do love this job. Drew Hine blew the glass, again. Client ecstatic, again. The book? Robert Caro’s second in his three-part biography on Lyndon Johnson: Means of Ascent. Fascinating read: the people who’s lives intersected with LBJ’s, the incredible power he eventually came to wield, and how that influenced 20th century history. Of course none of that would have come to pass had he not stolen his senatorial election, then helped Kennedy in the same way with their presidential bid. Well, seems to me someone did that in FL a few years back too, and look where that landed us. 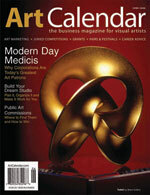 Art Calendar did a feature on sculptor Brent Collins for the June issue.Â Great article.Â Discusses his installations and upcoming LA show, as well as the Warner Brothers gig.Â As usual, he’s humble about it all. The piece on the cover?Â It’s only 5″ in diameter.Â The bigger ones are anywhere from 2′ to 10′. Drove down to Parsons, KS recently to attend the graduation of a kid I adore.Â My wife and I took him in when he was twelve, when his single mom was struggling, and when things weren’t so good at home.Â He just needed a stable place to call his own for awhile, and a man’s love.Â Later on he moved back home, where things are now great and where he has wonderful stepdad,Â but he still lives with us each summer and goes on vacation with us each July. Parsons is near the OK line, and more Southern than Midwestern.Â That’s why it was so cool in this graduating class to see so many Black and Hispanic kidsÂ receiving honors, and the town itself very well integrated.Â Decades ago those kidsÂ wouldn’t have had that opportunity or support, and even if theyÂ would have beenÂ allowed to cross the stage with the Whites, their parents would have had to sit in balcony of this old auditorium.Â Damn, this country’s come a long way–though it still has a long way to go. Anyway I adore this kid–I mean young man–but the punk’s taller than I amÂ now.Â Also I look 50, damnit.Â Well, it’s time.